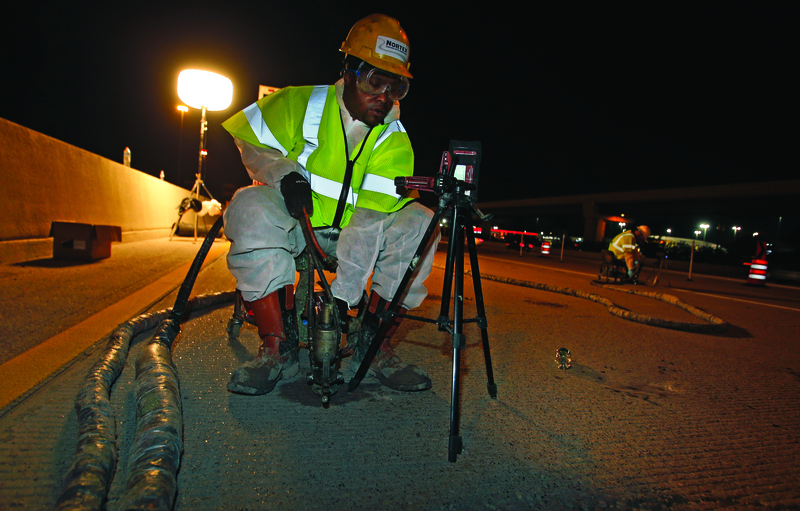 TerraThane foam requires the drilling of smaller holes than mudjacking. This helps maintain the structural integrity of the concrete. Using foam takes less time than mudjacking, which helps save money and effort. The foam is cleaner and lighter than the "mud." This means that less weight is added to the natural soil beneath the road, reducing the likelihood of continued erosion in the future. The result of using TerraThane foam is a smoother, safer road that is less subject to erosion -- and one that will stay that way for many years. NCFI Polyurethanes employs contractors who receive exceptional training in the use of TerraThane, coming to with years of experience in jacking highways and roads in hand. We offer rigs that carry the foam, supply the polyurethane materials for your construction projects, and we have the staff to guide and educate your team through the process of applying the foam. At NCFI, we'd be happy to provide all of the polyurethane materials for your construction projects. Contact us for more information about our training materials, applicator certification programs, and great products like TerraThane.